I am happy to report that Petes Travel Center has made the inaugural voyage for the Make a Difference Jamaican Cruise. As planned, the cruise was scheduled for October 5 – 9, 2014. This was a 5-day Western Caribbean cruise from Miami to Ocho Rios, Jamaica and Grand Cayman, Cayman Islands. There were a total of eight (8) cabins with sixteen people. As I explained on the Make a Difference Jamaican Cruise webpage, the aim of this cruise was for Petest Travel Center to bring school supplies to needy children in a local school in Jamaica. We did just that. 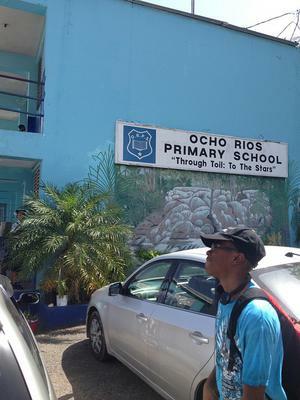 The school chosen was Ocho Rios Primary. This is a large school, hosting over 1,700 students in grades 1 through 6. In order to accommodate everyone, the school operates on two shifts – morning and afternoon. After making contact with the principal, Ms. McFarlane, about two weeks before setting sail, she arranged to have someone meet me at the Ocho Rios Cruise Terminal and bring me to the school. 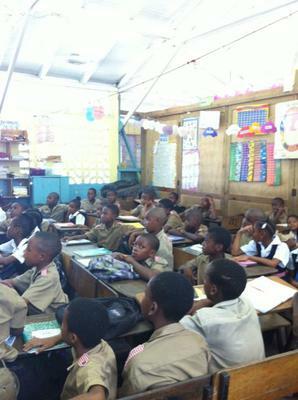 The group of us arrived in Jamaica on October 6th aboard Carnival Victory and my children and I visited the school. With us were two pieces of luggage. One piece contained about $200 worth of school supplies – notebooks, folder paper, crayons, pencils, pens, calculators, story books, glue sticks, etc. The second piece of luggage contained goody bags intended to be shared with some lucky students on my visit. Upon arriving at the school, I presented the larger container with school supplies to Ms. McFarlane. She then allowed me to visit two third grade classes for a few minutes. I spoke with each briefly and at the end asked some questions. Four students from each class were lucky enough to win a goody bag. For the other students, I left packages of chocolate candies with the teacher to be shared as she deemed appropriate. Before leaving the Ocho Rios Primary School, I asked Ms. Farlane about their welfare program. She had mentioned this before and proceeded to give me a list of students who are in need of funding for breakfast and lunch on a daily basis. I did not make any promises of assistance, but left with an intention to find a way to help. The cost for breakfast and lunch daily is $350 Jamaican, or about $3 US. Overall, it was a great trip. I am most grateful that Petes Travel Center (PetesTravel.com) had an opportunity to offer just a little assistance to needy children in the Ocho Rios, Jamaica. I am most appreciative of those who came along on the cruise, and made it possible for my agency to give the school supplies to the neediest students. 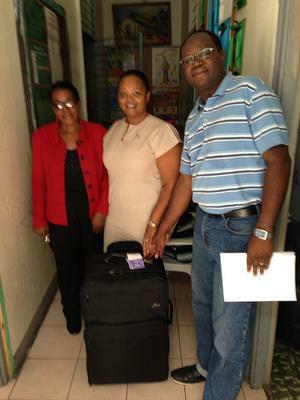 I look forward to many more opportunities to reach out to needy children in the Caribbean. Join in and write your own page! It's easy to do. How? Simply click here to return to Make Difference Cruise.